Calcudoku puzzles combine the row and column constraints of Sudoku with alternative bold-lined regions that have numerical constraints. They're sometimes known as KenKen™ puzzles, Sumdoku puzzles, Mathdoku puzzles or even KenDoku™. Each bold-lined region in a Calcudoku contains a small number along with an operator (+, -, ×, ÷) at the top-left of the region. Once the puzzle is solved, the given value must result when the stated operation is applied between all of the digits placed in that region. Digits can be repeated in bold-lined regions, so long as they don't repeat in a single row or column. To solve the puzzle you must place 1 to 6, or 1 to whatever the size of the puzzle is, once each into every row and column, while also solving each of the bold-lined regions. Look at the solved puzzle on the left. The 11+ region at the top-left must sum to 11, so the 1+6+4 given here is valid. The 8times; on the top row works because 2×4=8, and the 1- in the middle is okay because 6-3-2 = 1. For calculating - and ÷ regions, the order of the digits in the puzzle doesn't matter. Just start with the largest value in the region and subtract or divide by the rest of the values. Every Calcudoku puzzle only ever has one possible solution, and it can always be reached via reasonable logical deduction. In other words, guessing is never required. 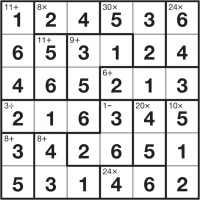 Calcudoku puzzles on puzzlemix appear at a wide range of sizes and difficulties. Usually they are 6x6 or 8x8, in which case you must place 1-6 or 1-8 into each row and column. Sometimes Mystery Calcudoku puzzles appear on puzzlemix. These puzzles work in exactly the same way except that the +, -, × or ÷ sign is replaced by a question mark, '?'. In this variation you don't know which operation is used - in other words it could be a +, -, × or ÷ region but it is up to you to work out which. Very occasionally more than one type of operation will work for a region, but there is always a unique solution for the numbers that fit in the finished puzzle. Are you searching for help with Calcudoku puzzles? Stuck on solving KenKen™? Don't know the instructions for Mathdoku? Need Sumdoku instructions? Want solving hints and tips for Calcudoku? Then puzzlemix is the place for you to play Calcudoku puzzles online. Looking for printed Calcudoku puzzles? Visit Sudoku Xtra for puzzle magazines and books. Or are you looking for a Calcudoku puzzle supplier? If so then check out Any Puzzle Media, my puzzle production company.